The Superfood you need for anti-aging! Home/Beauty Health, Cosmetic, Functional Medicine, General Medicine, Integrative Medicine, Nutrition, Primary Care, Women's Health/The Superfood you need for anti-aging! How this ancient grain can help you look younger! Everyone is always looking for the next big anti-aging quick fix! I often get asked what ingredients to look out for in anti-aging products as it can get confusing. One new ingredient that is taking the cosmetic world by storm is quinoa! Who would have thought? Quinoa is the new super food anti-aging ingredient! It’s full of protein antioxidants and numerous B vitamins; no wonder anti-aging products are using this as their core ingredient for their skin care line. 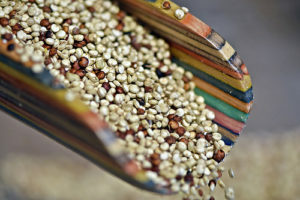 Quinoa, indigenous to the Andes Mountains of Peru, Chile, Ecuador and Bolivia is a stable grain for many. It has grown in popularity over the years for its ample source of protein, and whole-grain high fiber complex. Of course when it comes to skin care, all the properties are great at rejuvenating collagen, fighting free radiacals, decreasing dark skin and inflammation. Quinoa is also high in polyphenols, essential fatty acids, and numerous vitamins and minerals. Quinoa is rich in iron, manganese, potassium, copper, b vitamins like riboflavin, niacin,b6, thiamin, choline, and folate! Niacin or Vitamin B3 has been show to retain moisture and hydration leading to softer, smoother skin. It reduces fine lines, decreases inflammation and acne flairs by inhibiting fibroblasts associated with aging. Niacin also increases skin tone, leading to a natural glow. Niacin has used for years to treat dermatitis. Niacin in quinoa has been shown to improve acne overtime topically as well as orally. (2) Quinoa is great at reducing sebum production which is the main reason many people suffer with acne. The effect is best when ingested orally since it helps control blood glucose and insulin spikes due to his high fiber properties. It’s antioxidant properties decrease inflammation associated with acne quelling any redness and irritations associated with acne when used topically. Studies show that the phytochemical makeup in quinoa help prevent and treat skin aging through various affects by inhibiting oxidative damage of the cell. It fights wrinkles and fine lines caused by aging and decreased collagen production. It’s antioxidant properties help fight free radicals which is associated with aging and inflammation. Quinoa is also found to treat hyperpigmentation of the skin due to elevated levels of melanin. The quinoa extract also inhibits the matrix mellatoprotineases MMP that causes collagen break down over time. It then helps lighten dark spots by blocking melanin which increases hyperpigmentation. (1) This was published in the International Journal of Cosmetic Science in 2015. 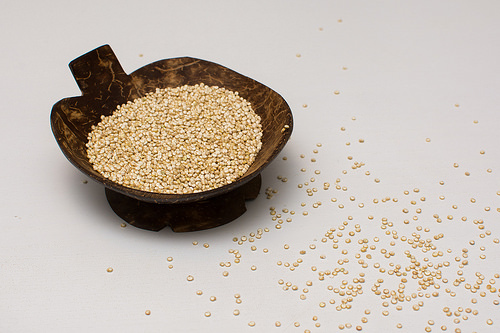 Quinoa is a great exfoliant because the grains in it’s natural forms work by gently removing dirt and dead skin cells. The best way to use this is by mixing 1 tablespoon quinoa with a couple drops of almond or jojoba oil and gentle cleanse your skin. Jojoba oil is great for people who suffer with acne and almond oil is a great anti-aging carrier oil. You can also make your own quinoa mask by using leftover cooked 1 tablespoon quinoa, 1 tablespoon yogurt, and 1 egg blend it all together for a nourishing anti-aging protein filled tightening face mask. Leave it on for about 20 minutes. You can always add a tsp of turmeric and honey for and added glow! 1. Graf BL et al. Compounds leached from quinoa seeds inhibit matrix metalloproteinase activity and intracellular reactive oxygen species. Int J Cosmet Sci. 2015 Apr;37(2):212-21.